Great Lake View from this newly remodeled, three bedroom, two and a half bath, Dollar Point Home located on a quiet street. Remodel includes a new Kitchen with big window for the Lake view, and open to the dining room and the family room, with new Hardwood Floors, Alder Doors, Windows, Extraordinaire Gas Fireplace, Banisters, Quartzite floors in the Entry and mudroom, carpet, and more. Big kitchen for the cook with all the cooking supplies and all new top of the line appliances including a warming drawer and wine refrigerator. There are both the living room and family room to enjoy with TV's in both, a breakfast room with view, and a more formal dining room with a Granite Table that can seat 6-8 people, two large decks with numerous lawns and landscaped grounds. The home has been remodeled with an open floor plan, granite in the baths, W/D, stereo w/CD player, 4 TV's, 2DVD's, DSL Wireless Internet, and deluxe furnishings. The home is within walking distance to the Dollar Point pool, picnic area, tennis courts, playground, ping pong, horseshoes, bocce ball, shuffleboard, putting green, and access to the beach & pier is nearby. Mountain bike right from the house and there are bike trails too. Close to hiking. 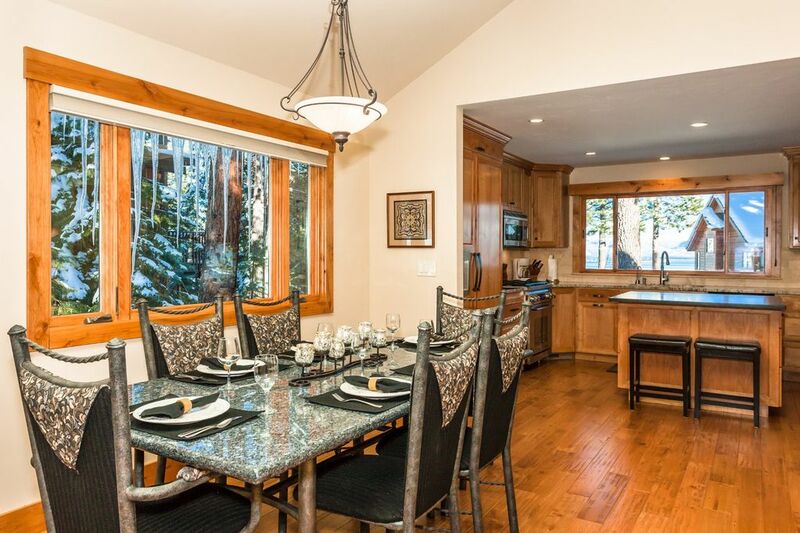 This home has a great location, about 2 miles east of Tahoe City's restaurants & shopping. It is conveniently located for golf or skiing. A 15-20 minute drive to North Tahoe's first class skiing & snowboarding. Renter to pay Handling fees. This home in Dollar Point Subdivision of Tahoe City was my primary residence where my kids grew up and went to school. They walked to the pool by themselves and it is on a very quiet short street. Dollar Point is the nicest subdivision on the North Shore with the best and most amenities. I live in Truckee so I am close by to take care of the property. I know you will enjoy your stay at my home. I didn't want to sell my wonderful home when I bought a new home in Truckee so I decided to turn it into a vacation rental in 2002. The location in Dollar Point is the best and I can still use all of the amenities. Dollar Point has the best amenities of any other subdivision in North Lake Tahoe. Don't be fooled by VRBO's listing of Dollar Point properties. Most of them listed in Dollar Point aren't really in Dollar Point and they don't have all the amenities. Make sure to ask about the amenities. toilet, Upstairs: Bathroom with toilet, sink and access to shower. There are 1 1/2 half baths upstairs and a full bath downstairs. The Lake View is fabulous from the kitchen, family room, master bedroom, and both decks. The view is towards Crystal Bay, Incline Village, and the East Shore!!! The Sierra Mountain Range is beautiful in all seasons. Enjoy it from the kitchen, family room, master bedroom, and both decks. Local Calling and 800 numbers but no Long Distance.There is an answering machine too. Forced Air Natural Gas and space heaters available too. Quality Sheets and extra sets if needed for every bed in the house. Extra pillows provided as well as different types and firmness. Electric Blankets to warm up the bed and lovely comforters. The Washing Machine is in the home and laundry soap is provided. The dryer is in the home. Wood Burning Fireplace in Family Room and Extraordinaire Gas Fireplace in Living Room with a fan to heat up the majority of the house. There is a two car garage, two spaces in the driveway and in the summer three more spaces on the street. There is also a side where a boat or trailer could be stored. Plenty of Bath Towels, Beach Towels, and kitchen Towels provided as well. The Living Room can seat 8 or more people. The extra seating could be on the hearth of the fireplace. There is a smart TV with a DVD Player. It is very comfortable and inviting. Brand new Bosch quiet Dishwasher. Enjoy the Lake View while loading the dishwasher. Brand newThermador Refrigerator and Freezer with outside ice and water dispenser. If you have a big group there is another refrigerator in the garage for your use. Brand new Dacor high end Stove and cook top. High output burner. Cook with a Lake View! Brand new Dacor high end Oven. Warming Drawer which is one of my favorites. Cook with a Lake View! Brand new Dacor Microwave and Convection Oven! Enjoy the Lake View while cooking! Coffee Grinder, Espresso Maker, Regular Coffee maker, Tea Kettle, and some tea on site. This kitchen is stocked with nice plates, and you will find anything that you would have in your kitchen. I have everything including storage containers for your food. Kitchen has all new appliances including a warming drawer and an extra refrigerator in the garage, It has everything you need to create your favorite dish. Coffee Grinder, Espresso, Coffee maker. Breakfast Table in Family Room has two extra chairs if you want to seat 6 people at the table. Granite and Iron Dining Room Table that can seat 6 people or can be expanded to 8 people.. There are two HDTV's with DVD Players and there is another TV with a DVD Player. Two of the three bedrooms have TV's. Charter Cable is the provider and there is expanded Cable. There is a stereo with CD Player, Radio, and Cassette. There are books that we have read or guests have left at the house. There are different board games and cards available for your use. There are sand toys to take to the beach. The lawn has plenty of room to throw balls and play games. The deck has a great Lake view & a large grass area below the deck. There is a dining table and four chairs on the lower deck and there are 2 chaise lounge chairs & another chair and ottomon on upper. There are 5 Courts within the Homeowners Association. You can make reservations. Three courts are at the Swim Club and two are down at the beach with a fabulous view. Dollar Point Homeowners Association Pool has a diving board. It is close to the house within walking distance. They provide nice lounge chairs, showers, and updated bathrooms. Please inquire first before Book Now so that we can iron out details of your stay such as whether your dog would be allowed. I feel that communication with the renter is important both for you and for me. It makes your stay more personal. Nearby Mountain Biking & Bike Trails, Rafting on the Truckee River, Gambling, 8 Lakeside restaurants within 15 minutes, 8 Ski areas within 30 minutes, 9 golf courses within 30 minutes. If you are interested in renting a motor boat, jet ski, Stand Up Paddle Boards, and Kayaks they are available in Tahoe City only 5 minutes from the home. Stand Up Paddle Boards are also available in Carnelian Bay 5 minutes away. Emerald Bay is not to be missed which is the most photographed picture of Lake Tahoe. There is also the beautiful Vikingsholm at the end of the bay which has a great tour for a minor fee. The Tea House on the island is very cool too. Eagle Falls is right there and if you cross the highway there is another great hike to another beautiful lake. One of the most favorite hikes that I take friends who visit Tahoe is the Rubicon Trail to Emerald Point which is another option. It is mostly along the water with the most fantastic views of Big Blue! Sand Harbor on the East Shore is a beautiful beach and the East Shore usually has warmer water for swimming. There are so many options for fun please feel free to ask me any questions because I have lived in the area since 1972.